vCenter deployments are likely to change for large companies as they upgrade to vSphere 5. Traditionally vCenter has been installed in one of two designs. The primary decision was whether to split off the database onto a second server. Smaller shops simply installed vCenter and MS SQL (or even MS SQL Express for the very small) on the same server. 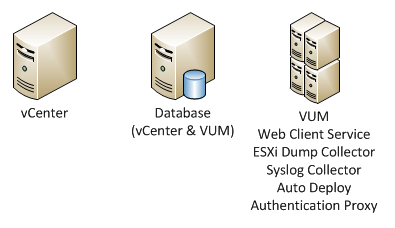 Now for very large deployments, some companies create a third separate server for the vCenter Update Manager (VUM). This was particular important for anyone using the VM guest OS patching feature, as that capability could consume significant resources for a vCenter which managed lots of VMs. However this guest OS patching was never a particularly popular feature with large enterprises, as they usually already had a working patch solution that they stuck with. When VMware announced with the release of vSphere 4.1 that it would remove the guest OS patching feature in the next iteration, it really put the nail in the coffin. So I’d postulate that this 2 server model is the one that the vast majority of vSphere users have at the moment. 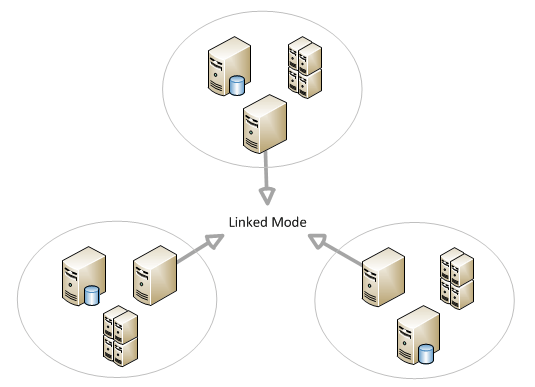 Personally I think very large organisations with the most demanding of vSphere infrastructures are more likely to scale-out to multiple vCenter instances using Linked Mode, instead of further splitting this 3 server model. Once these are overcome we’ll see an even more diverse mix of designs. vSphere architects will be able to slice-and-dice with more efficiency, and scale as required in a more dynamic fashion. For now I think we’ll see this 3 server design become de rigueur. The Web Client has a “service” component that should be installed centrally. Once this service is installed, it has to be registered via a browser (with Flash) on the server that it’s installed on. It cannot be registered remotely. I’m not sure how good I feel about having to install Adobe Flash alongside my critical vCenter components just for this registration step. This is a nice and simple high-level “what’s new and different” view of vSphere 5 from a service:server mapping perspective. Thanks for taking the time to put it together and share. You do not need to install adobe see the vSphere 5.0 upgrade guide you can register the webserver using command line.